On October 8, 1889, Jielis Hendrik Vervoorn (40), his wife Klasina Mulder (35) and their children Margaretha (10), Hendrik (8), Anneke (6), Arie (4) and Jacobus (1) arrived in Argentina. 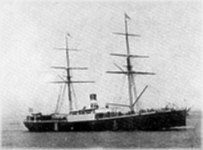 They had travelled with the steamship “Leerdam” with a deadweight of 2,796 gross tons, a 2 cylinder steam engine and 2 masts, square rigged. It could travel with a speed of 6 knots. At the time the Vervoorn family arrived in Argentina, a worldwide economic recession had had devastating effects on the Argentine economy. Many of the Dutch emigrants couldn’t get a proper job, and thus weren’t able to feed their families. People with debts were even whipped into forced labor. From august 1891 onwards Dutch Newspapers reported about those problems. 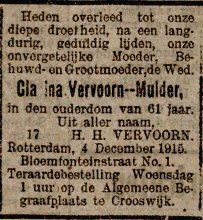 The Vervoorn family had returned to Rotterdam when their youngest daughter Jacoba was born on 30-8-1892. Jielis Hendrik Vervoorn was born on 30-9-1849 in Brakel, Gelderland. His parents are Hendrik Huibert Vervoorn (1819-1870) and his first wife, Anneke van der Balen (1816-1854). Jielis was married, aged 26, on 23-8-1876 in Rotterdam to Clasina Mulder, aged 21. Clasina was born in Amsterdam, but her parents Arke Luitjes Mulder (†1869) and Margaretha Friema also reported the births of childeren in Idaarderadeel, Friesland, and Rotterdam. Clasina Mulder died on 4-12-1915 in Rotterdam at the age of 61. Jielis Hendrik Vervoorn had died on 15-9-1913 in Rotterdam. Anneke Vervoorn was born on 29-6-1877 in Schiedam, Holland. Anneke died on 9-8-1877 in Rotterdam. Margaretha Vervoorn was born on 9-3-1879 in Rotterdam. Margaretha married (1) on 22-7-1903 in Rotterdam Heiltje van der Meer, 25 years old, born in Harlingen, son of Rein van der Meer and Petronella Benning. Margaretha married (2) on 12-8-1908 in Rotterdam Jacobus van Veenendaal, 26 years old, born in Rotterdam, son of Willem van Veenendaal and Anna Elizabeth Vervoorn. Hendrik Huibert Vervoorn was born on 17-2-1881 in Rotterdam. He was married on 6-1-1926 in Rotterdam to Geertruida Wilhelmina Martina van Stappen, aged 27 and born in Kralingen, now part of Rotterdam. Their son Jieles Hendrik was born on 1-11-1927 in Rotterdam. Hendrik died a widower on 23-10-1957 in Rotterdam, aged 76. Anneke Vervoorn was born on 4-5-1883 in Rotterdam. Arie Vervoorn was born on 6-6-1885 in Rotterdam. Arie was married on 11-11-1908 in Rotterdam to Maria Louisa Mathilda Smit, 20 years old. She was born in Watergraafsmeer, daughter of Wilhelm Frederik Smit and Johanna Lucretia Susanna Bon. Jacobus Vervoorn was born on 11-2-1888 in Rotterdam, and died there on 3-1-1890, aged 1. Jacoba Vervoorn was born on 30-8-1892 in Rotterdam. Jacoba was married on 4-9-1912 in Rotterdam to Cornelis Pieter Spruijt, 21 years old. He was born in Charlois, now part of Rotterdam. His parents were Bastiaan Spruijt and Pietje Koster. Like me, Jielis Hendrik Vervoorn is a descendant of Jillis Gerrits Grandia who lived in Brakel. His daughter Maijke Gillisse Grandia was married to Hendrik Vervoorn, while their grandson Hendrik Jillisse Vervoorn was married to Huibertje Grandia. Sources: Emigratie naar Argentinië, WieWasWie.nl, rotterdam.digitalestamboom.nl, wrecksite.eu, halpostcards.com, delpher.nl.